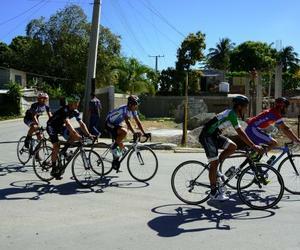 Rafael Arrate (Santiago de Cuba), Javier García (Artemisa) and Yoandry Freyre (Sancti Spíritus) were the medalists, in this order, in the first stage of the Guantánamo-Pinar del Río-Havana Cuba´s National Road Cycling Tour, which started yesterday in this city. Arrate, champion of the day, also won the intermediate sprint of this first stage, earning thus the right to wear the yellow jersey of leader. The three cyclists covered the stage in the same time (1 hour and 28 minutes). Today´s stage, 106 kilometers, starts in Guantanamo city and ends at the mountain of La Gran Piedra, and has three intermediate sprints in the towns of La Maya, Songo and Santiago de Cuba. This will undoubtedly be one of the most exhausting stages, especially the last 14 kilometers in middle of the mountains, at more than one thousand meters above sea level. The caravan, heading west, will not stop until Havana´s Capitol (new seat of the National Assembly of People's Power), where it will arrive next February 26, when returning from Pinar del Rio´s municipality of Los Palacios.